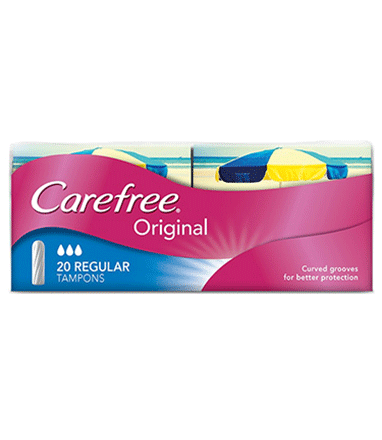 CAREFREE® Original Regular Tampons provide reliable protection when you need it most. The unique curved groove design directs fluid efficiently inside the tampon so that you feel better protected. Plus, the Anti-Fluff technology gives you a smooth surface so that you don’t have to stress about fluff. Use only one tampon at a time and we recommend to use the lowest absorbency tampon to suit your level of flow and for your own comfort.